We have come to the last Sunday of the church year and the last Sunday of our year of Matthew. This Sunday is also celebrated as the Feast of Christ the King or the Feast of the Reign of Christ. 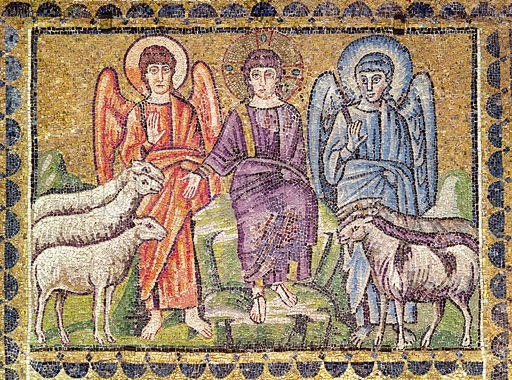 The text is the prophecy of the sheep and the goats and is a judgment prophecy. The context of this passage is important in that it is contained in the very last teaching discourse in Matthew. Immediately following this – in chapter 26 – we move into the passion narrative. It is important to recognize this on a day in which we are celebrating the “Kingship” of Jesus for Kingship looms large in the Gospel of Matthew. The kings of this world (like Herod in Chapter 2) are enthroned in glory and splendor and have power and authority concentrated in them. Some of them were considered to be gods. But Jesus, our King, is enthroned on a cross, wearing a crown of thorns. Jesus does hold the authority and power of God, but gives it up out of love. The resurrection enthrones Christ at the right hand of God, but not before the Passion. This context is very important for understanding this judgment prophecy. Judgment is a part of our faith and certainly influences our understanding of God. Some of us have come to understand the Gospel only in terms of judgment. For these people the Gospel is a series of rules and regulations that MUST be followed or else. For others of us we downplay judgment to the point that it becomes little more than a slap on the wrist. The prophecy of the Sheep and the Goats makes clear that judgment is real and that both of those understandings are incomplete. This parable helps us to understand a couple important things about judgment. 1st – Judgment is the consequence of Sin. Judgment is the consequence of our actions, our behaviors and our decisions. This image of God giving out earned but basically unjust punishments that seem out of proportion to the infraction itself is simply an incorrect understanding of the Gospel. Sin is our putting ourselves in the place of God and pushing God out of our lives; the results of Sin are the sins of hurting others as we push our selfish agendas. The consequence is that we will destroy ourselves and others. We bring judgment on ourselves. Thus, earthquakes and hurricanes are NOT a sign of God’s judgment. The goats here are not destroyed by a tornado. We will learn that they goats are separated out and judged because they have consistently put themselves in the center of their own universe pushing God and others out in the process.